A few years ago, Zach Miko's girlfriend bet him $500 that one day he would be featured as one of People magazine's "World's Most Beautiful." While Miko was happy to have "tricked" a gorgeous woman--and occasional fitness model--into believing he could make such a list, he didn't feel beautiful. At the time, Miko, who is 6-feet, 6-inches tall and weighs 275 pounds, was playing the role of "Dinosaur Troubadour" in a puppet show at a prehistoric-themed amusement park in New Jersey. He wasn't exactly model material. "She's always been very confident in me," Miko says of his now-wife. "But it was a ridiculous bet. As a man-of-size, you spend your whole life knowing you're a big guy and you kind of also know that you're not traditionally attractive from start to finish." Then, in July, Miko was walking up Fifth Avenue in Manhattan when he received a call that changed all of that. 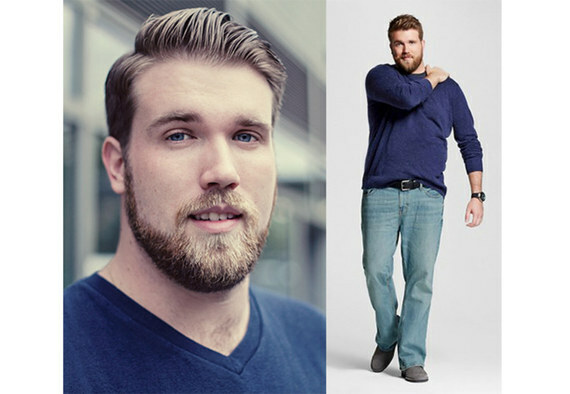 Target wanted him to be the company's first plus-size guy to model its big and tall line. For Miko, who can vividly recount the pain he felt as a nine-year-old when a girl called him ugly, the moment was surreal. He said yes and celebrated by treating himself to an overpriced doughnut. Miko is big but not bovine, tall but not towering. He has blue eyes, sandy blond hair, and the kind of healthy brown beard that would make tree bark blush. He looks good sporting Target's tame t-shirts and jeans, even if he clearly doesn't know what to do with his hands in some pictures. One unexpected benefit of the Target job was that Miko found a pair of pants that fit. After his first shoot, he purchased five pairs. Curiously, standing alongside Miko on Target's "big and tall" website are much thinner men. In fact, the other models are comically slim for a big and tall clothing line. The fashion industry has long been off-limits to anyone with a waistline wider than a bicep. But lately, the women's industry has begun to welcome curvy models. They've appeared in major editorials for Ralph Lauren, Levi's, and Vogue. They've walked runways in Milan, Paris, and New York. Yet, the men's industry is lagging. The gaunt, broomstick builds popularized by Hedi Slimane campaigns a decade ago for Dior Homme are still the frame de riguer for male models. Super slim suits look best on super slim boys. The closest any plus-size model has come to modeling at a major fashion show was at L.A. Fashion Week in October when, modeling a black, yellow, and teal, spandex onesie made by the flashy men's underwear line Marco Marco, Dexter Mayfield--built more like a tulip than a straw-grass super model--sashayed down the catwalk wearing five-inch heals. 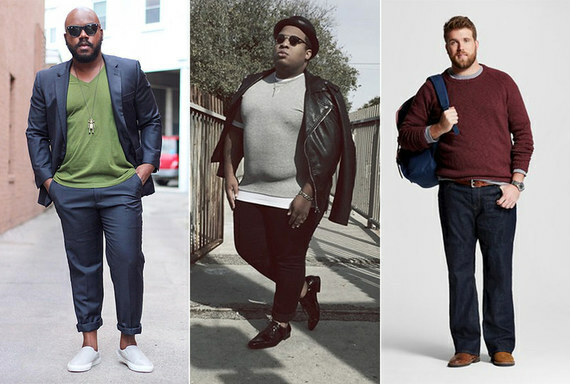 "There isn't a plus-size male model in the industry on the runway, and we were closing L.A. Fashion Week, so I was a bundle of nerves," Mayfield says. Despite the nerves, Mayfield thrilled the audience, which exploded in cheers as soon as he started his strut. "It was a feeling like no other, the entire room just gave me so much love and energy." The moment has been watched 550,000 times on YouTube and was even shared by Stefano Gabbana. The attention hasn't led to any modeling gigs for Mayfield, but he's hopeful. "I'm excited to see where things go. I would love to make it to New York, or Paris, or Milan, but if it happens to another amazing, handsome, beautiful male model, that's great as well." Bigger runway models aren't the only piece missing from the men's fashion world, so is plus-size clothing. As such, the men's clothing industry has neglected scores of men looking for fine threads that fit. (Miko admits the most expensive piece of clothing he owns is a New York Giants jersey.) For Kelvin Davis, who runs a body positive men's fashion blog under the name Notoriously Dapper, the breaking point was a trip to Express three years ago. He'd spotted a red blazer that he liked but the sleeves of a 42R didn't go past his elbows. When he asked for a bigger size, he was told the company didn't make any. "Express is trying to tell me that they don't want larger guys wearing their jackets," Davis told me. "So I decided to make a fashion blog because I realized there were a lot of guys struggling to look stylish in their own bodies." Davis, who is built like an undersized linebacker, began sharing pictures of himself modeling trendy outfits full of flannel, denim, and leather. He started to develop a following--much of it credited to the support of plus-sized model superstar Tess Holliday--and now boasts some 27,000 followers on Instagram and plenty of traffic on his blog. "When I started I figured it was just my grandma and my mom looking at it. But men struggle with this just as much as women do--men just aren't as vocal about it. I know a lot of guys don't want to be out there complaining about how jackets don't fit at Express, but I'm not afraid to speak up because I know who I am. The fact that I care about how I look doesn't make me less of a man." In November, Davis was one of 10 men of various heights and girths chosen to model a line of nostalgically short shorts made by Chubbies. While he'd love to make a living as a model, he isn't about to quit his job as a middle school art teacher. For now, Davis is hoping that other clothing lines will follow Chubbies' lead and hire more body positive models. Jamaal Carroll founded Oublier (French for "to forget"), a contemporary clothing line that caters to men of size. But when it came time to shoot his first collection, he couldn't find models. "Thus far, we've found our models on the streets of L.A.," says Carroll. 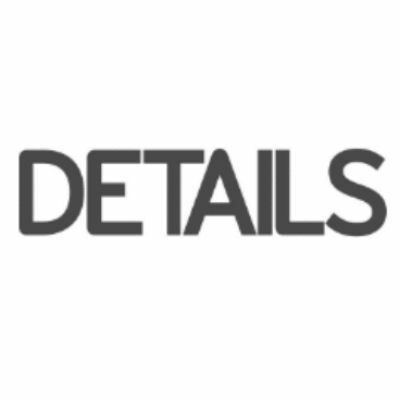 "To be completely honest, I automatically assumed that the models I was looking for wouldn't be represented at agencies." And he's right. The only legitimate modeling agencies finding work for big and tall male models are in Germany. One New York agency told me they recruited plus-size men on an as-needed basis, usually plucking them from the aisles of big and tall stores. Another French modeling agency told me their plus-size men "are more plus size than they are models." While Target isn't the sort of campaign that models dream of, the mere presence of a truly big and tall guy modeling an international company's clothing line has been enough to land Miko in headlines around the world. Tabloids and blogs have celebrated him. He appeared on Good Morning America. But all of the attention hasn't meant anything to his bank account. Though he makes far more money for a day of shooting with Target than he ever made at the dinosaur theme park, he's unsure if he can turn it into a career. "It's frustrating because I've been talking to these agencies and even though there's no downside to them signing me, they're still hesitant. They tell me, 'If we sign you we have no idea what's going to happen because this has literally never been done before.' Like having me on they're website would be a risk." Still, the attention has been fun. Miko even did an interview with People magazine. "I still don't think it's possible," Miko says of making the magazine's "Most Beautiful" list. "But I never thought it would be more likely now than it was two years ago."